The regular celebration of the eucharist takes place during each Liturgy. Our regular weekend schedule is Saturday 4:30 pm and Sunday 8:30 am and 10:30 am. For weekday Liturgies, please check the bulletin. For children, First Eucharist is usually celebrated in the second grade. Preparation is provided through our Office of Catechesis. 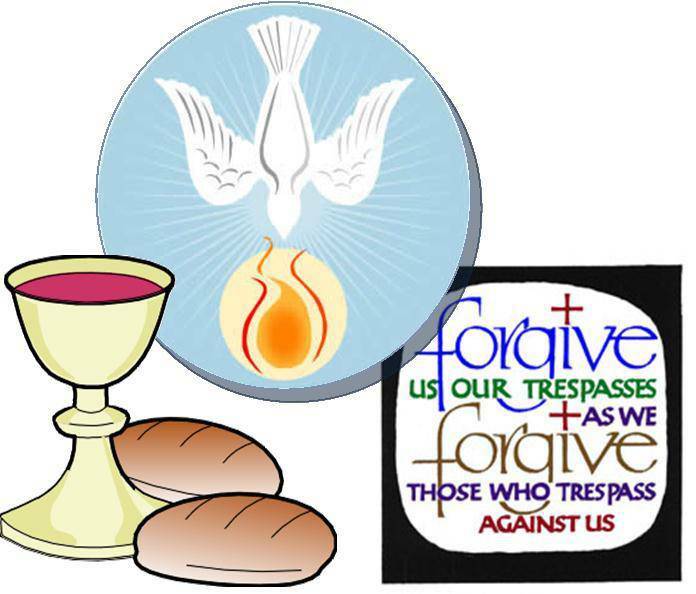 Register here for Sacramental preparation for First Reconciliation/First Eucharist. Low-gluten communion hosts are available at all weekend liturgies to those suffering from Celiac Sprue disease. The hosts made by the Benedictine Sisters of Perpetual Adoration in Clyde, MO, contain 0.01% wheat gluten, are accepted by the United States Conference of Catholic Bishops (www.usccb.org/liturgy/celiasprue.shtml), and are recommended by the journal Gluten-Free Living as “perfectly safe” for sufferers of Celiac Sprue disease (Vol. 9, no. 1). The Archdiocese of Dubuque has approved these low-gluten altar breads for use in the Archdiocese. Therefore we have developed the following procedure to provide as much protection as possible for those with Celiac disease. St. Pius has purchased several pyxes. A pyx is a small round container that holds one unconsecrated host. These, along with the low-gluten hosts, are kept in the Vesting Sacristy (see map). When you arrive for Mass, go first to the Vesting Sacristy. There, on the counter, locate the 3-drawer storage unit. The top drawer contains information about Celiac disease, copies of this procedure, and information about the low-gluten hosts. The bottom drawer contains pyxes, low-gluten hosts, and small white cards which summarize this procedure. Take one of the pyxes and place a low-gluten host in it. Snap the pyx shut and place it on the small plate on the Gift Table (see map). All the pyxes are kept on a plate separate from the large bread plate. During Mass, the small plate with the pyxes is brought forward with the bread and wine. One gift bearer carries the large plate of bread, and one carries the pitcher of wine and the small plate of pyxes. (If available, a third person can carry the plate of pyxes.) If there are no pyxes at that Mass, the empty plate is left on the Gift Table. The bread, wine, and plate of pyxes are handed to the Presider as usual. The low-gluten hosts are consecrated at the same time as the regular hosts. The pyxes are left closed to avoid contamination. The pyxes remain on their own plate while the regular hosts are divided among the communion plates. As each Eucharistic Minister walks to his/her communion station, the Presider hands the plate of pyxes to the crossbearer (one of the altar servers). The crossbearer then stands behind the Presider at his station until someone needing a low-gluten host comes forward. RECEIVING COMMUNION: There are no pre-assigned stations for any of our Eucharistic Ministers, including the Presider. No matter where you are sitting in church, you will need to join the line of communicants that leads up to the Presider. This may mean walking down a side aisle and going to communion on the opposite side of the church from your pew. We apologize for this inconvenience; but hope that with all the movement of people this will be rather inconspicuous. When you reach the Presider, whisper to him that you need to receive a host from one of the pyxes. They are all the same and each contains one host. The Presider turns to the crossbearer, snaps open one of the pyxes, raises it before you and says, “The Body of Christ.” You bow your head and reply, “Amen,” as the Presider turns the pyx over and – without touching it (to avoid contamination) – drops the host into your hand. You consume the host and return to your pew. The pyx is left open and returned to the plate. When all the pyxes are empty the crossbearer places the plate on the Credence Table (see map). Those who choose to receive the Precious Blood may drink from any cup EXCEPT the one on the far north, near the organ in the music area. This cup contains a fragment of a regular host which Father placed in it during the “Lamb of God.” This liturgical action, called the “commingling,” represents the resurrection of Christ, the reuniting of his Body and Blood. 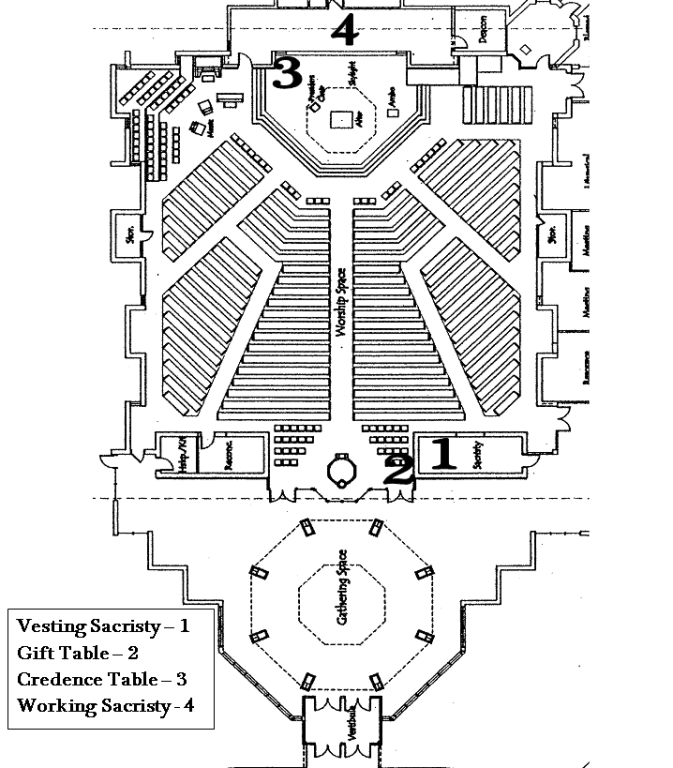 After Mass the Eucharistic Ministers take the plate of pyxes to the Working Sacristy to be cleaned (see map). They perform the ritual rinsing and washing of vessels as usual, making sure that the pyxes are cleansed and washed first, separately from the regular bread plates. After being washed, the pyxes are dried thoroughly and left open to air-dry for a few minutes. Once the communion vessels are washed, one of the Eucharistic Ministers snaps the pyxes shut and returns them to the Vesting Sacristy. The empty plate is returned to the Gift Table or, after 11:00 Mass, to the Vesting Sacristy. If you have any questions, please contact the St. Pius X Director of Liturgy at 393-4445 ext.111, or liturgy@crpiusx.org.